Front sea view fully air-conditioned apartment, with two double bedrooms (one queen size bed and one twin bedded), bathroom with large enclosed shower base, rain showerhead and hand shower. Living room and dining area (four seats). A large sliding window/door gives access to the large terrace, from where you enjoy stunning views of the sea and Strait of Gibraltar. Fully equipped kitchen, Satellite TV and safety box. Property refurbished to a modern style at the beginning of 2018. Swimming pool surrounded by mature well-kept gardens with direct access to “La Fontanilla Sandy Beach”. Sunbeds are provided at the swimming pool area. Private parking place at the building's garage situated at Camilo Jose Cela Street, Marbella's finest central location on the pedestrian beach promenade, linking the city with the world famous Marina 'Puerto Banus'. The beach front apartment building 'Caesar Imperator' has in its immediate vicinity all amenities, the nicest shops, restaurants, bars, supermarkets and gourmet stores. The Marbella Marina and a beautiful Park are just a block away, the charming Old Town with a wide selection of “tapas bars” and Restaurants only a few minutes’ walk. The perfect atmosphere for fun and relaxation. <FREE WIFI ACCESS AVAILABLE IN THE BUILDING'S LOBBY> Can also be provided in the apartment on request (small charge). Bathroom with large enclosed shower base, rain showerhead and hand shower. There is an office in the building with English, German and French speaking staff and a concierge during the day time, to assist you. We had a good stay in the apartment,the view and location is perfect, however the apartment needs maintenance, for example loose toiletseat, loose watertap, and no wifi,this has to be arranged seperately. Chairs at balcony were uncomfortable and needed cushions,would have been nice to have a dishwasher also since all the glassware in cupboards were not really clean.However Edificio Imperator has a great location and would surely stay again. I am glad to know you enjoyed your stay in my apartment. I appreciate your comments concerning the maintenance subjects, these always help us to improve our offer for our comming guests. Definitely stay again. What a location. So handy for restaurants, beach and well maintained garden and pool. We felt home the entire 6 weeks. Very nice people in the entire building. Great concierge. Carlos was the gracious host and we just enjoyed every bit of our stay. Very centrally located , near the shops and markets and restaurants. We definetly will go back again. Marbella and location of property was outstanding. We were a 2 minute walk to beach and view from condo was outstanding. We cannot say enough about the location. Close to restaurants, grocery store and any convenience you can think of. The walk to historic area of Marbella was within 15 minutes. The boardwalk was better than anything we have seen in either the French or Italian Riviera. If these are the only things you care about, this is the property for you. The actual condo building is clean but interior is in need of a little renovation but is not bad. The indoor parking was good and building is secure. The condo itself is spacious, a good size 2 bedroom and a good size bathroom area. The general impression is that the condo needs a new paint job and kitchen could do with some updating. If you are staying here for only a couple of days, you can put up with some of the deficiencies but for longer stays, some corrections are required, and would not be difficult. 1/ Needs internet connection in condo. Only available in downstairs lobby and this was not always reliable. Major drawback. 2/ Beds are uncomfortable. If trying to get return customers or elevated reviews this needs to be corrected. 4/ Toilet kept running after flushing. 5/ Linen was thread bare. This property has potential but needs an overhaul. If improvements were made based on above comments ( even if price increase ) would stay again. 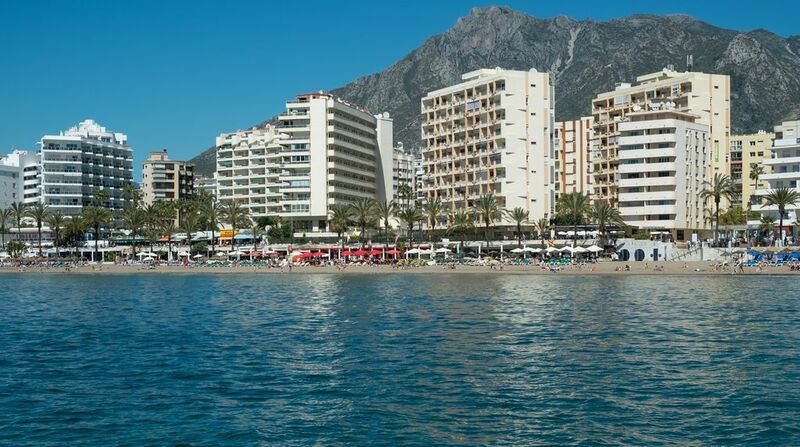 Located on first line beach row in Marbella Centro this appartment was on the 8th floor and gave stunning views of the sea. The appartment was spacious and functional. The addition of satalite TV was appreciated. The downsides to the facilities was the bathroom which was dimly lit and the shower head was situated too high to use hands free. The other niggle was the fact that we stayed there for 12 days and no cleaning maintainance ( bedding change, towels) was performed. We normally expect this function to be preformed once per week. The appartment did not have air conditioning but relied on the through air flow from the sea which was OK during the day but the nightime was hot. Partially offset by the provison of a fan. All other aspects of the appartment was great. Marbella itself is wonderful for a holiday. Restaurants a plenty catering for all tastes and at all rates. Beaches are a sunworshippers paradise and appartments' pool was an excellent altenative if you don't like sand in your toes. Marbella offers excellent shopping facilities for those who need retail therapy when on vacation. Plenty of bars and cafes to refresh onese;f at any time day or night. If you don't drive then the local transport system is very good and very cheap. Bus anywhere local costs 1.16 Euro single fare. I would recommend staying here to anyone wishing a relxing holiday to switch off from the day to day pressures. Marbella enjoys a mild weather all year round and offers a wide variety of the finest attractions. Considered 'Golf Paradise', over 20 golf courses are within 30 minutes drive. Some other attractions: Selwo Safari Park, Selwo Marine Park, “Tivoli” show & amusement Park, dolphins watching in the straight of Gibraltar. An hour drive to Historic places like Ronda, Granada or the impressive Nerja Caves.